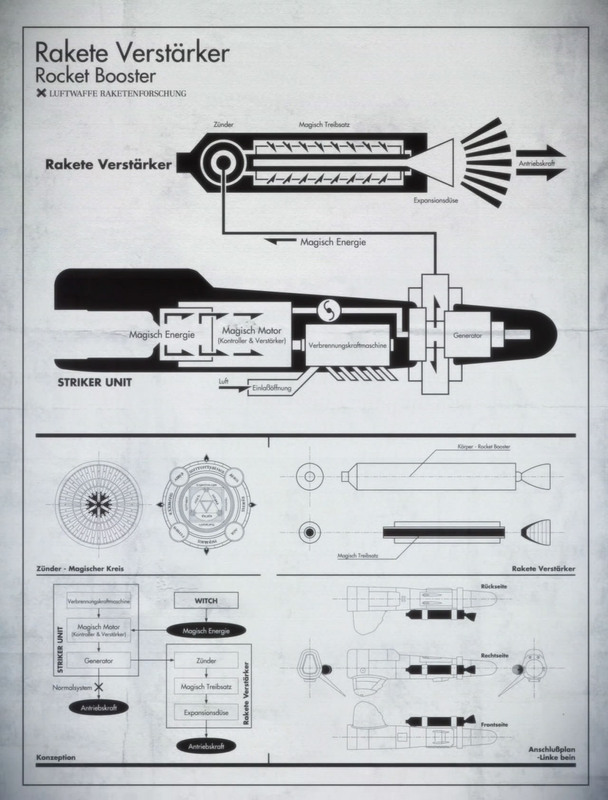 After all my talk about propulsion and escape velocity back in episode four, it was pretty awesome to see those concepts put into effect against an orbital elevator-like Neuroi. 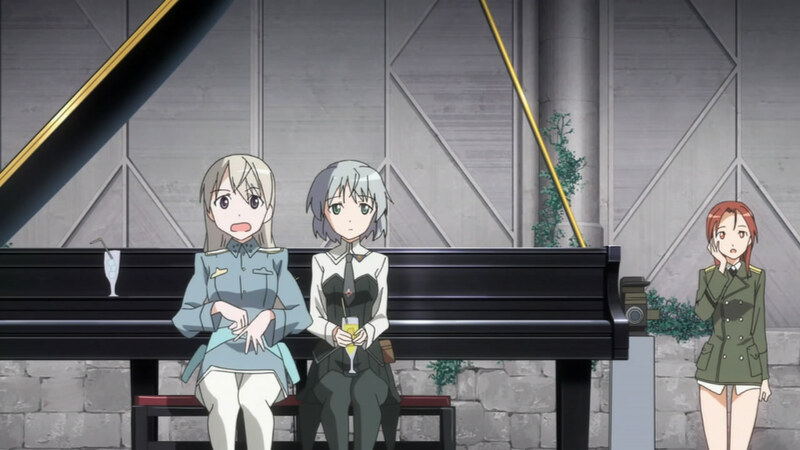 With signs of jealousy from Eila and a duet insert song to make up with Sanya, this is easily one of my favorite episodes of the new season too. 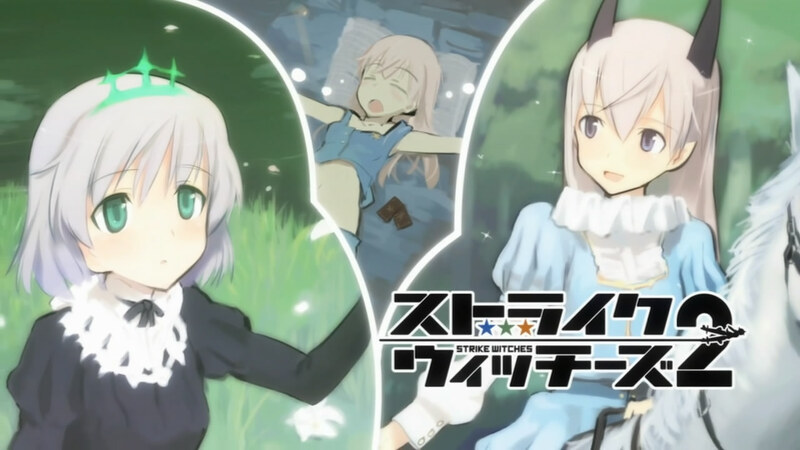 Eila and Sanya always had a pretty close relationship, so it didn’t come as too much of a surprise that it verges upon “knight in shining armor” levels. 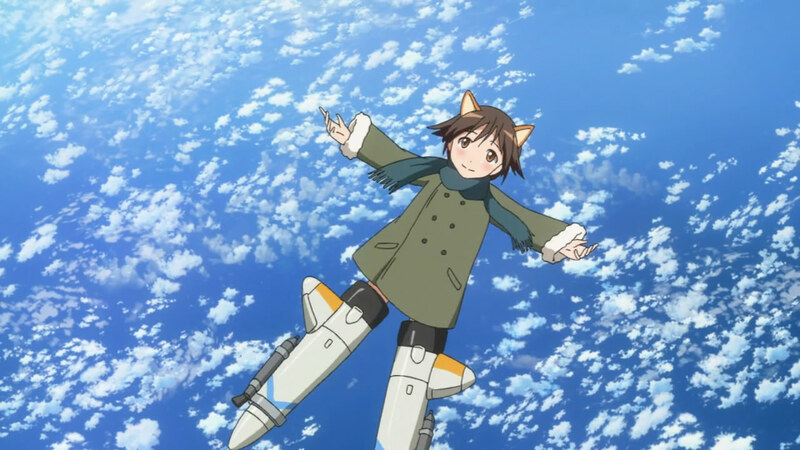 It was however, very cute to see Eila jealous of Yoshika for being assigned to protect Sanya in their rocket booster-equipped operation to climb 33 kilometers into the Earth’s stratosphere. The two of them looked like they were fighting like a married couple at times, with Eila being the husband of sorts that caused the problem of course (she does wear the pants in the relationship after all). 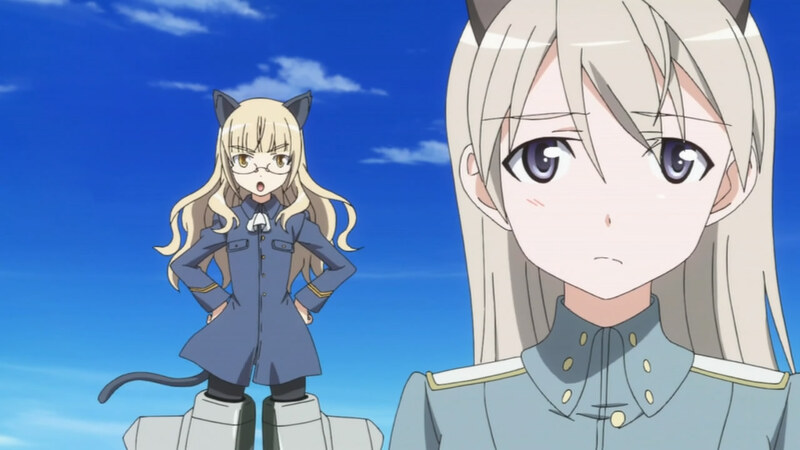 In addition to Perrine and Erica, Eila’s tomboyish personality also made her a favorite of mine during season one. 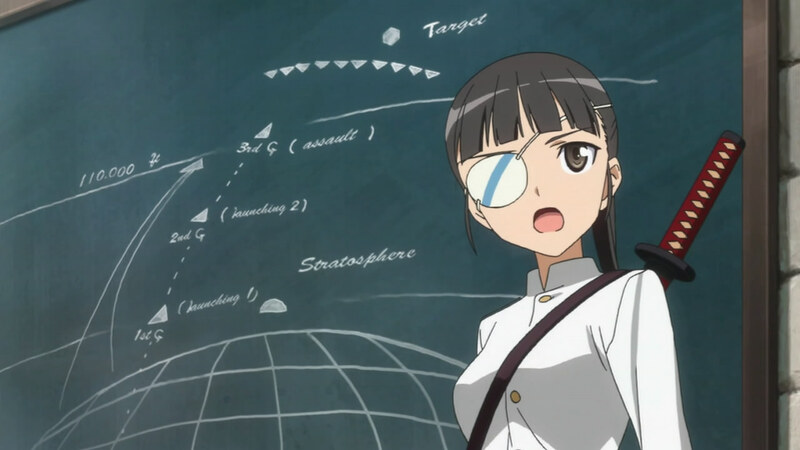 She only went on to reiterate that here, with how she got on Yoshika’s nerves by gloating about never using a shield in actual combat up until now (something I never noticed back in season one) and going on to try to enlist Perrine’s help to scheme against Yoshika — both of which reeked of stupid behavior I’d expect from guys. 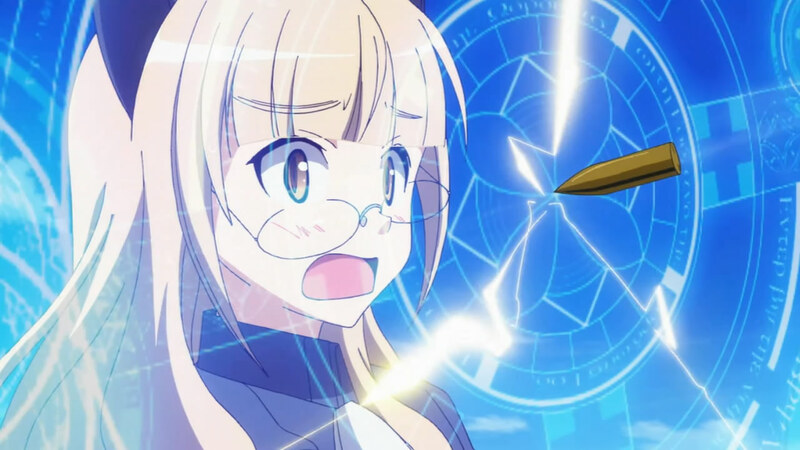 This also includes her not taking her shield training seriously when Perrine was the one she’s supposed to protect, leaving the latter freaking out like crazy when she started dodging Lynne’s rounds. 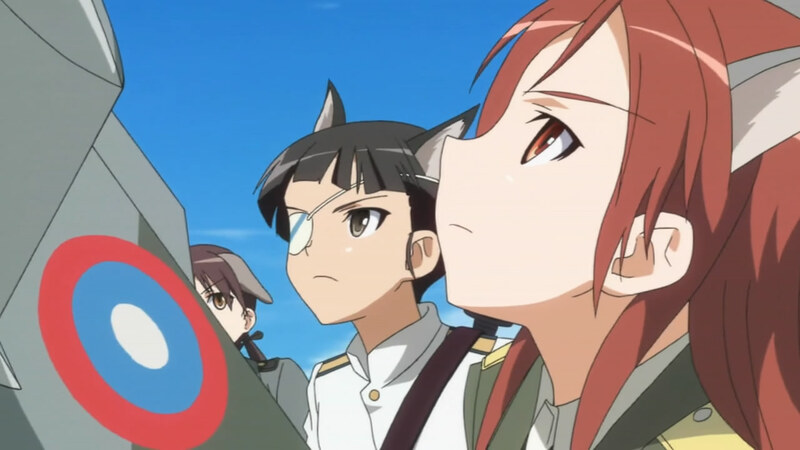 While I realize that Strike Witches has never really been about profound character development, it’s little things like this seen in Eila that make me enjoy the series a lot more. 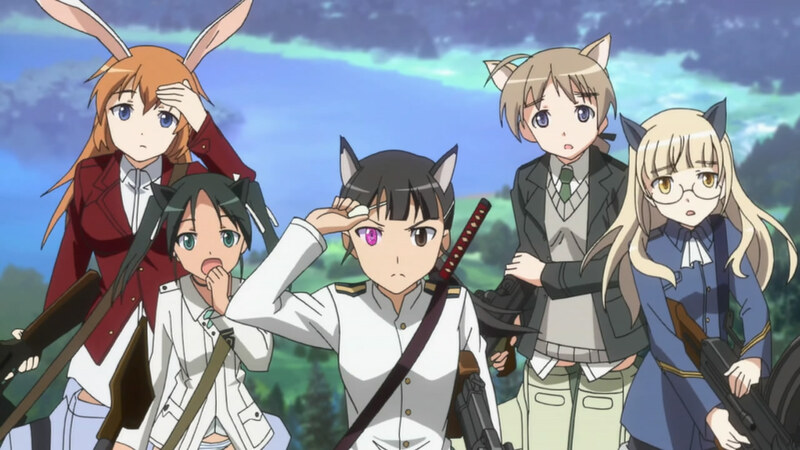 There are also a lot of ideas borrowed from history and portrayed as homages to it, plus some real science involved that work really well with the cute characters who bring it all together. 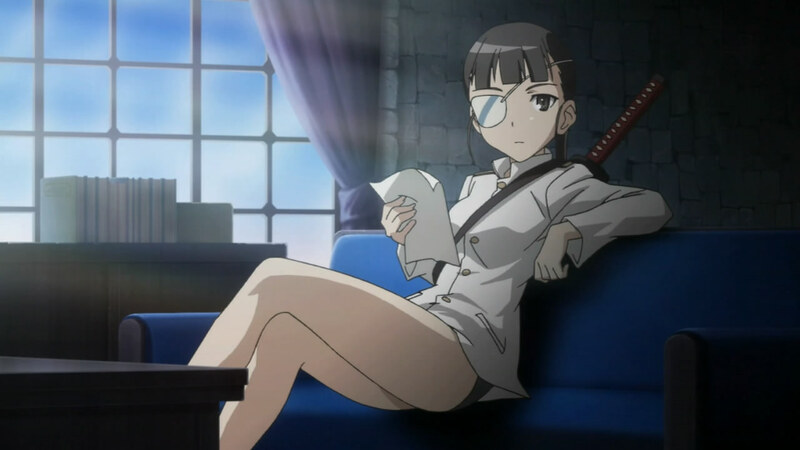 Naturally, they slip in the fan-service now and then, which from an underwear perspective hasn’t been nearly as frivolous as the splash made in the premiere. Instead, we’ve started drifting towards the periodic sauna and bath scene, where the moonlight works its magic and takes streaking to a whole new meaning. Compared to the “interesting” camera angles in combat, this is probably the more accepted way of slipping in some fan-service. 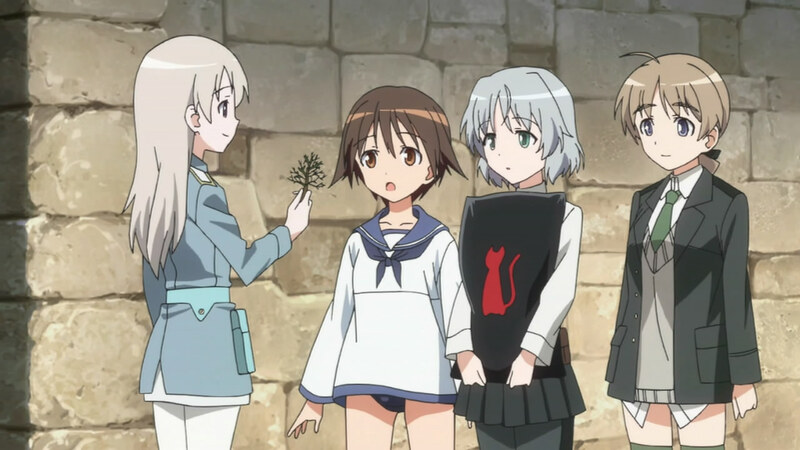 As I mentioned before, I’d watch this series all the same if all of the fluff was taken out and everyone wore pants in this alternate universe though. 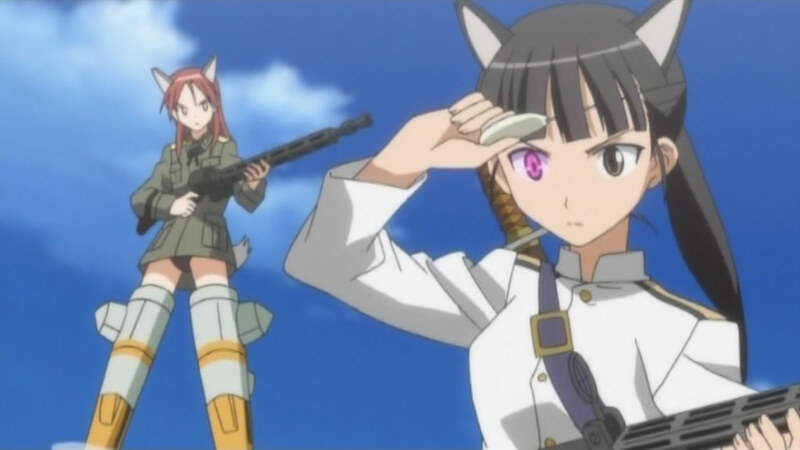 All the characters are plenty interesting on their own with their cute designs, various nuances, and cast of seiyuu, so it’d be akin to So-Ra-No-Wo-To in terms of young girls at war. The fact that there is this renowned element of fan-service on top is purely bonus in my eyes. 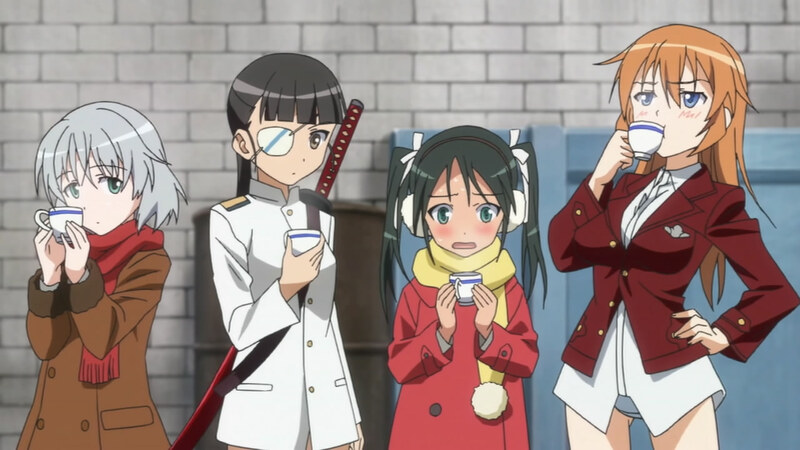 For example, I just love the more comedic side seen when the girls were trying out Lynne’s ginger tea, and the utter awesomeness of the screenplay during their operation — neither of which are fan-service-related. 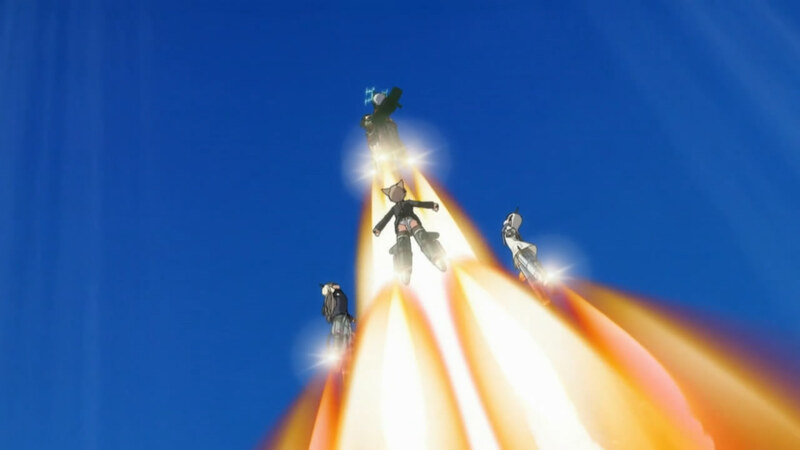 Hearing Mio explain the operation from a prior briefing while it was actually happening added a nice touch, whereas seeing the girls break off in stages and their rocket boosters kicking in was so cool with the music played during it all. 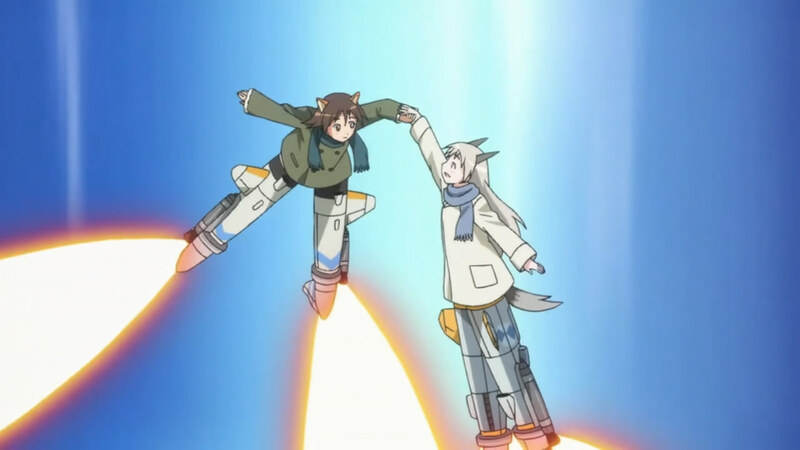 Who needs pantsu when you have rockets! 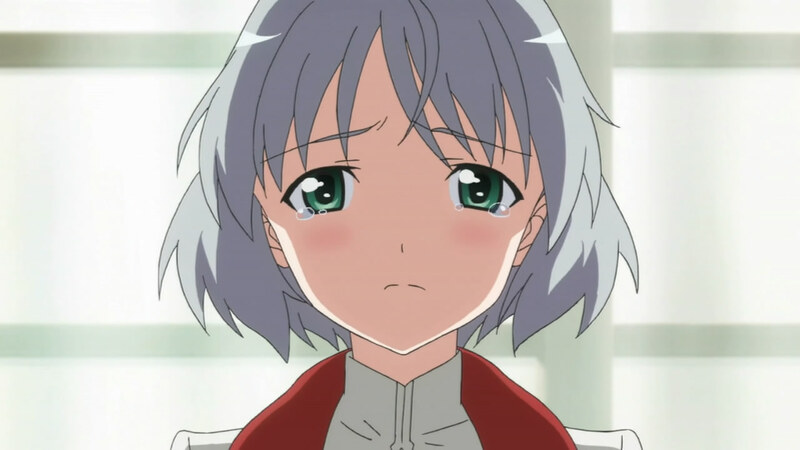 The finish was really sweet as well, with Yoshika giving up her shield duty for Sanya and letting Eila be with her instead. I wasn’t expecting a duet insert song to be added, but it made a lot of sense since sound travel without the air found in the Earth’s atmosphere. (Yay, more science.) 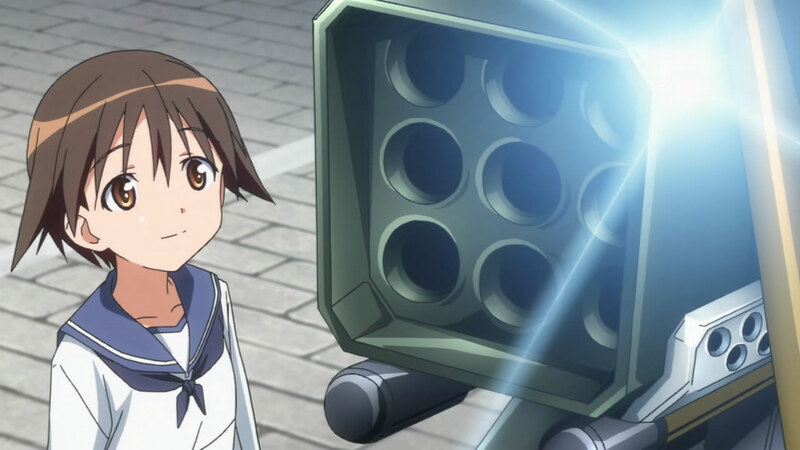 The first shield used by Eila in combat and a volley from Sanya’s Fliegerhammer sealed the deal without too much difficulty, but I still couldn’t get the Yoshika’s smile off my mind after she handed off Eila to Sanya. 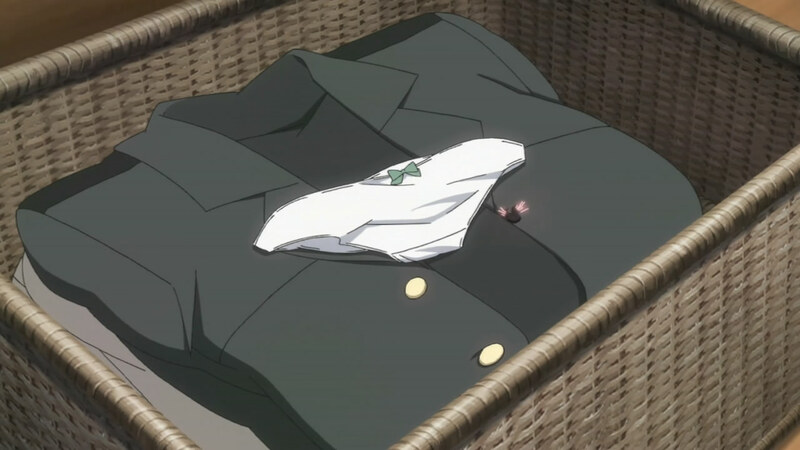 Hats off to Yoshika for being the better person, especially after Eila was out to get her. 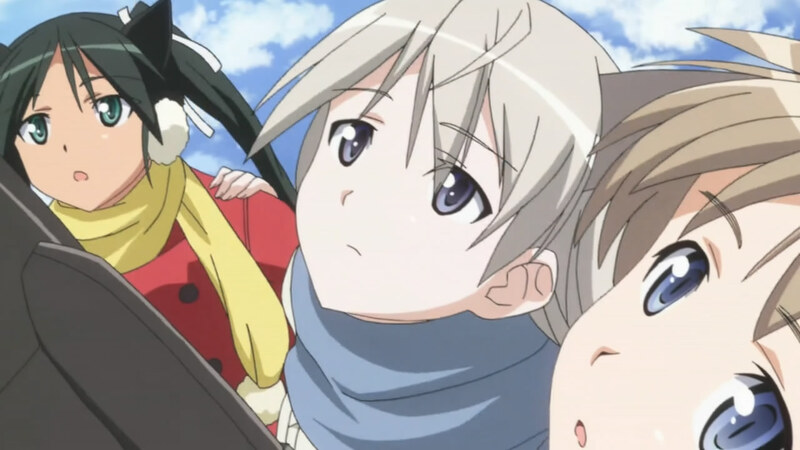 On a separate note, I actually don’t mind AIC Spirits’ use of 3-D rendered characters in the more distant shots, since they do a pretty good job blending them with animated ones. 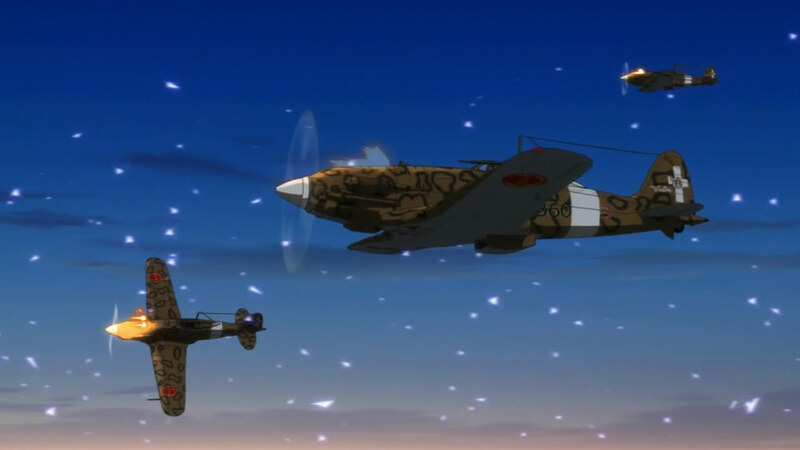 I actually thought the opening scene with Eila flying circles around Yoshika and keeping the conifer branch away from her was pretty well done in 3-D. 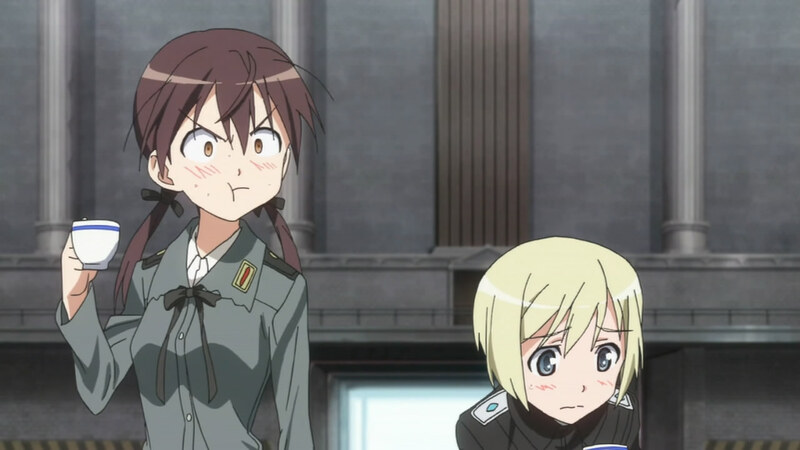 Anyway, a Neuroi bug infiltrates the base next time and gets into the girls’ clothes. 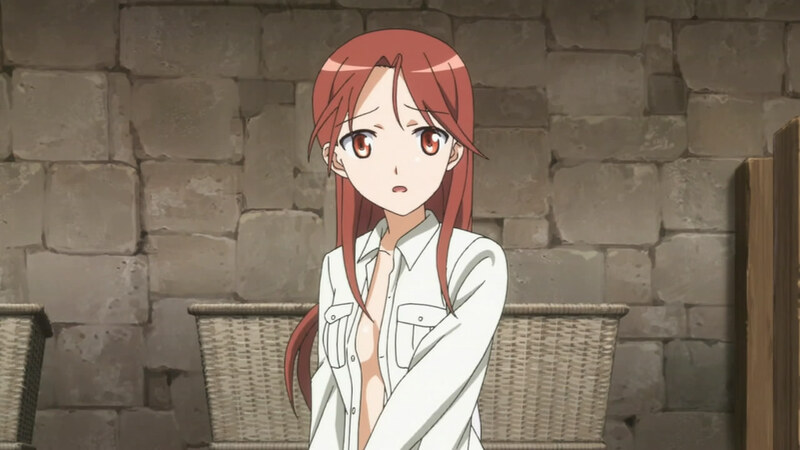 Judging from the preview, it looks like it’s going to be a bit more fan-service involving Minna as well. Wow…a strike against neuroi using Macchi C205Vs and an Avro Lancaster dropping a “Bouncing Bomb” (“Dam Busters”). Good research there. I love how they respected the whole no sound in space thing. lmfao, they have magic to talk to each other I guess. P.S. Assuming that this post was suppose to be sarcastic. Actually no, if you watched they touched head to pass the sound(vibrations) so they could talk. 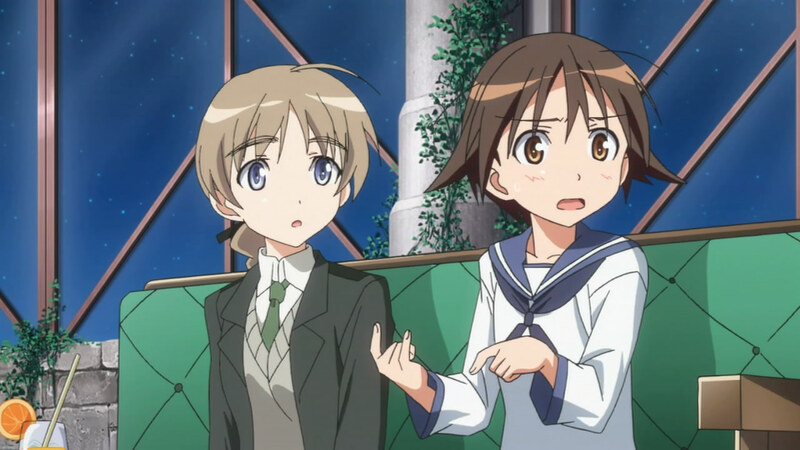 It’s good that they switched to the other character of the pair for 5 and 6 this season. 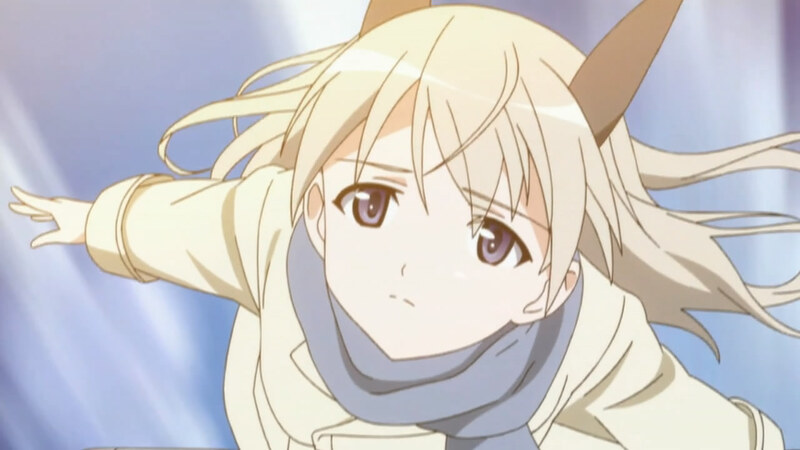 AIC, second season of Saki?? Make it happen?? Yoshika is the kindest sweetest girl and my favorite character. Was pissed that she was mean to her. Where was the kiss???? The setting was perfect the killing needed a sealing kiss !!!! 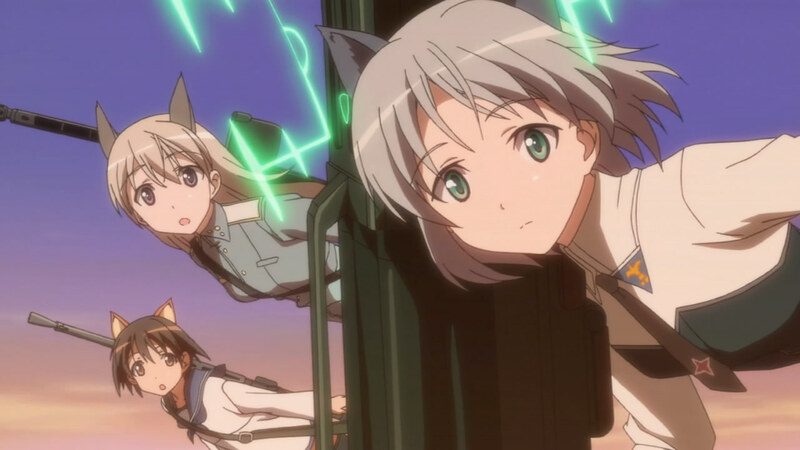 Eila x Sanya is easily the best yuri couple in Strike Witches, they both love each other so much that one would go “HNNNNG” at all the heartwarming. 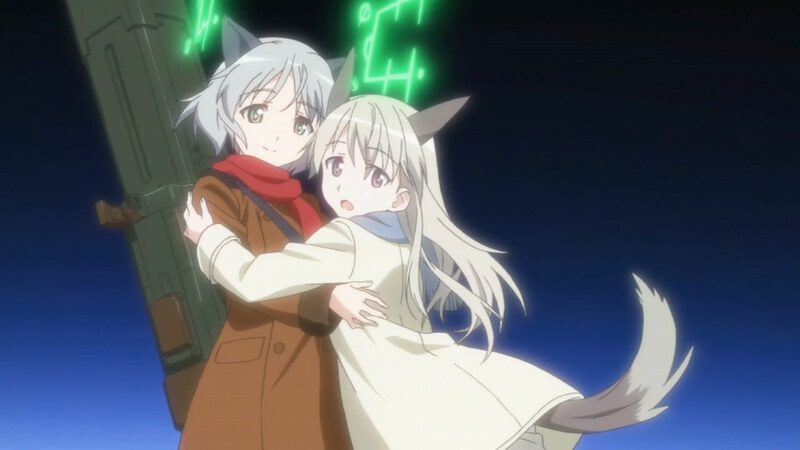 When Sanya contemplated whether to fly back to Orussia seeing it from orbit, Eila didn’t even hesitate by offering to go anywhere Sanya goes. 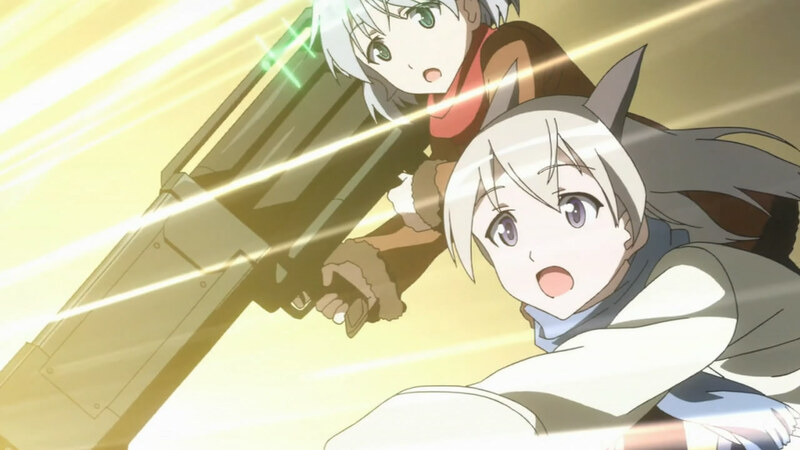 After last season’s Eila x Sanya ep focused on Sanya, it was good to see Eila getting the spotlight. 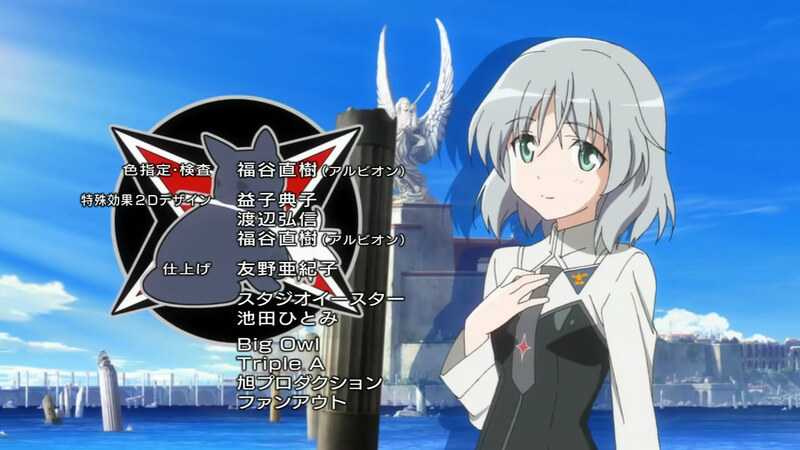 Her laidback voice and undying love for Sanya (to be point of being cutely jealous of Yoshika for her unwitting advances on Sanya) was what won her for me as my favourite SW girl. 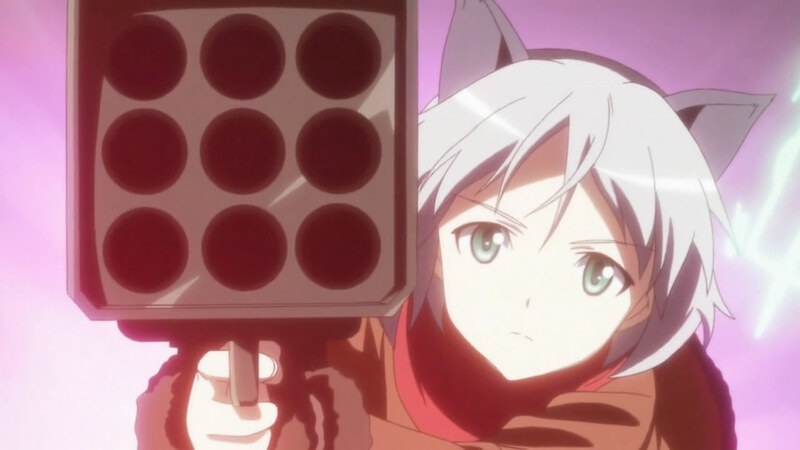 BTW, LOL at the blatantly unsubtle censoring. 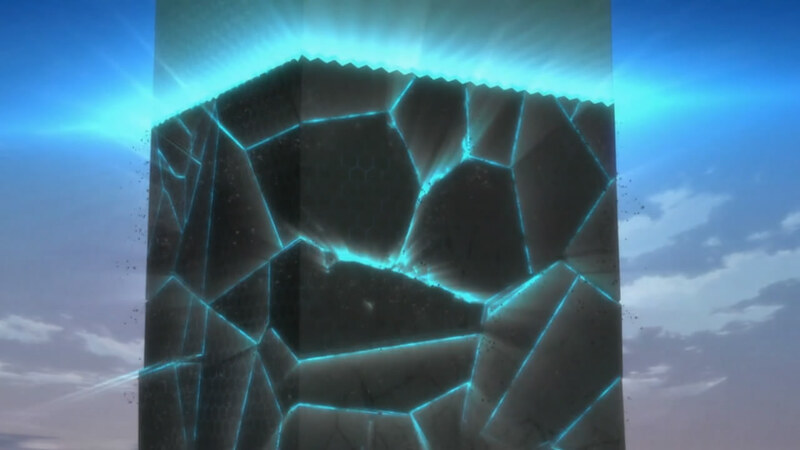 WTF was with those two horizontal beams of ray? I’ll be looking forward to the DVD version. 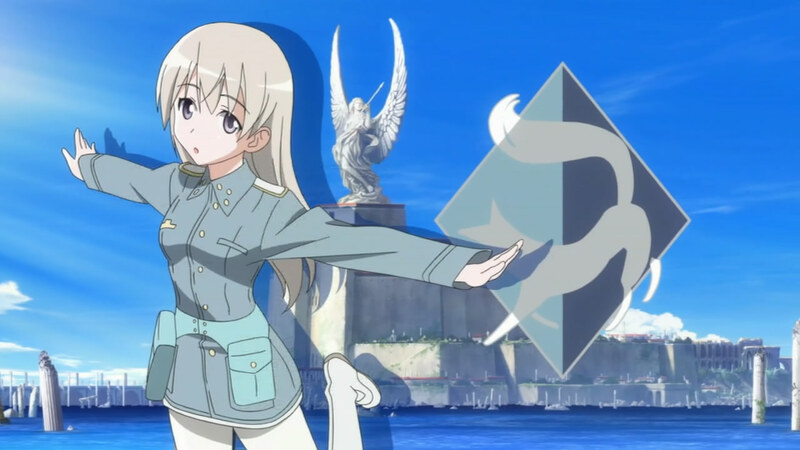 Trivia: Eila’s seiyuu Ohashi Ayuhi used to go by the stage name of Nakai Erika, and only recently switched to her current one. 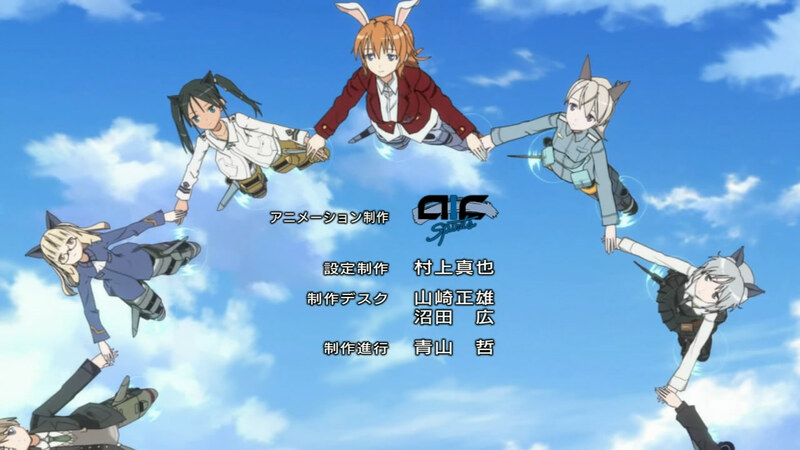 Hence this is why you see Eila credited as that in season 1. 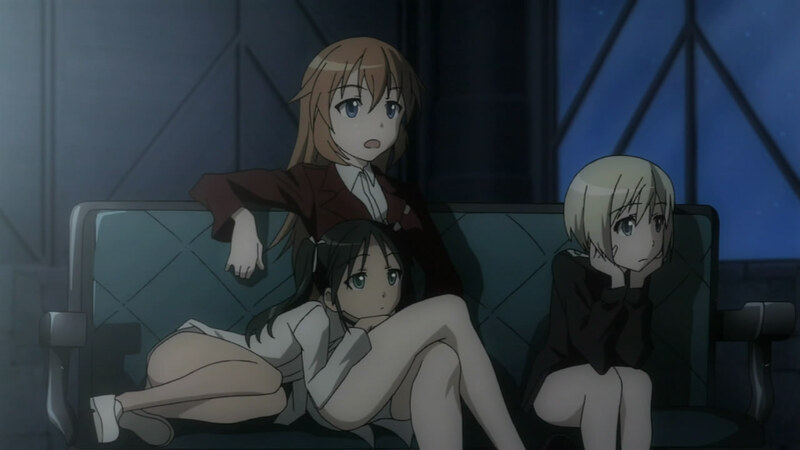 You could tell since Eila’s still speaking in her same laidback voice. 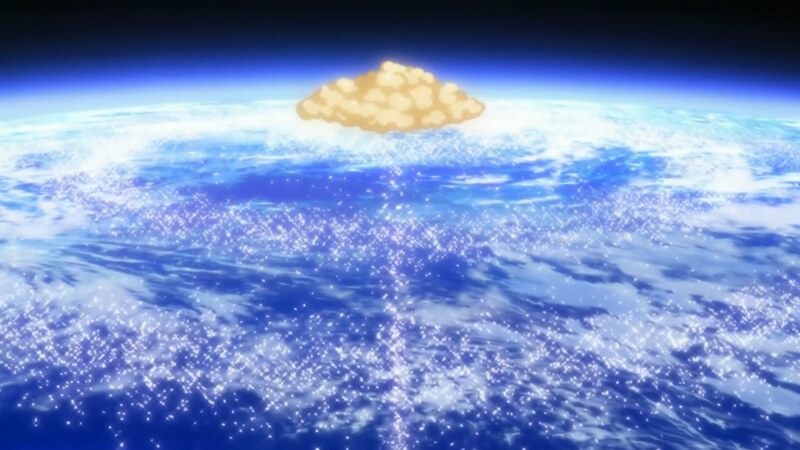 The insert song made it even more special, no? I’m glad they finally got a bit of a challenge. Seemed like some of these neuroi were getting a little too easy for them. I want a Neuroi with Memento Mori Capabilities LOLZ and Mio will act like 00-Raiser with a huge lazor cutting it down. 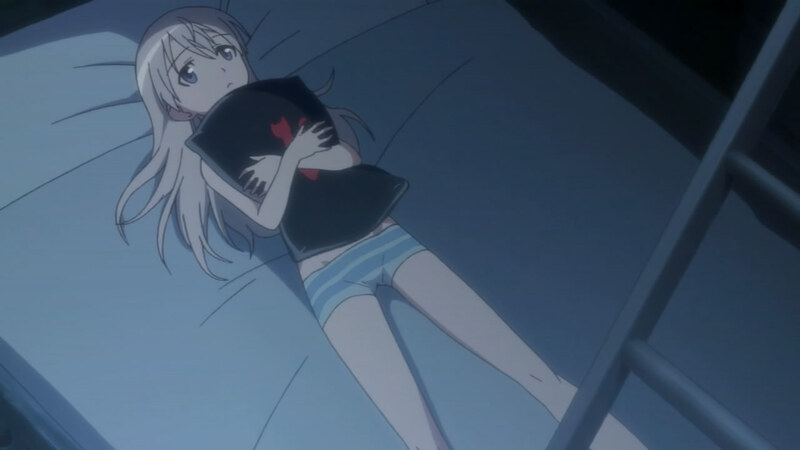 this anime is better of WITHOUT a 2nd season… I just dont get why they’re showing us this kind of fillerish episodes again. 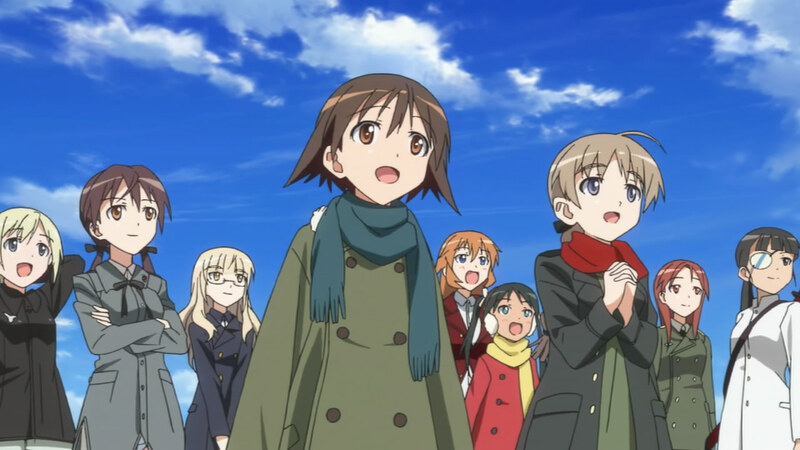 the 2nd season is basically the same as the 1st season. 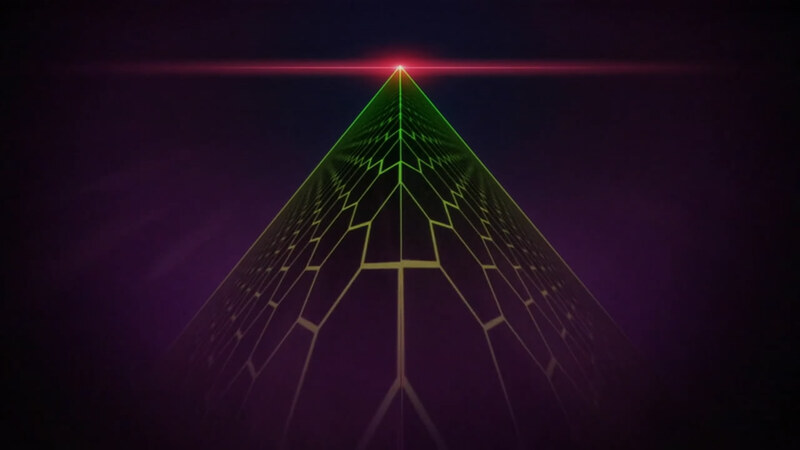 Even if the pacing is similar, it’s new story and in high definition. Season one was pretty damn blurry in comparison. are we FINALLY going to see Minna naked? she’s the only one from Season 1 we never got to see in her birthday suit. and are you sure it’s Neuroi bug? 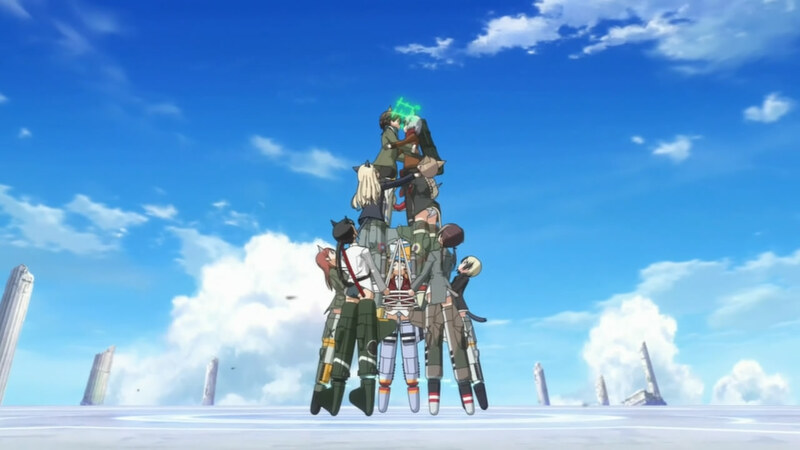 i thought it was a regular bug that perhaps gets into Minna’s cloths and she reveals that she’s actually afraid of bugs and goes overboard with ordering the whole squadron to dry and find and kill it. then again and Neuroi bug would be an interesting twist. Pants, why won’t they wear pants!